Tributes have been paid to a community champion who has died aged 89. Audrey King, who was awarded the MBE in 1999 for services to the community and local communities, has been remembered by her family as a great organiser and motivator. Daughter Angela Milner said: “She was extremely well-known in the local area. She had a great ability to get a group of people to do things together. Mrs King raised money for Marie Curie Cancer Care, Christian Aid and International Aid, as well as St Catherine’s Hospice, which she supported for more than 25 years. St Catherine’s Hospice volunteer Beryl Clark was a member of the Penwortham and Longton Hospice Support Group with Mrs King. The group raised funds to establish the hospice in the 1980s and continued to fundraise to develop the charity up until 2007. Beryl said: “Audrey joined us in the mid-1980s and she became instrumental in organising a lot of fundraising events in Penwortham. As well as the larger, annual fundraisers, Audrey arranged coffee mornings and other small events in sheltered accommodation communities. This was a fantastic idea because they helped to raise funds for the hospice, and they significantly benefited the elderly residents too. “She worked so hard for her community and was very focused on helping people; she not only supported St Catherine’s, but other charities and her church too. 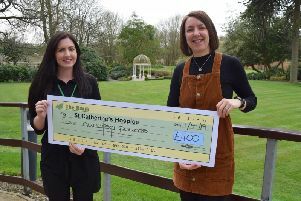 Stephen Greenhalgh, chief executive of St Catherine’s Hospice, said: “St Catherine’s simply wouldn’t be here if it wasn’t for the determined efforts and commitment of people like Audrey, who contributed to such a mammoth fundraising mission in the early days. Mrs King was born in Widnes and qualified as teacher, specialising in English and RE. Having moved around the country with husband Ken who was part of the Church Army, the family settled in Penwortham in 1960 when Ken joined the Lancashire Probation Service. In Preston Mrs King worked at Trinity High School, William Temple, Tulketh High, Ashton-on-Ribble High and she volunteered teaching English with the city’s growing Asian population. Widowed in 1981, she threw herself into her church work, having been made one of the first women lay readers in the 1970s. She became Emeritus reader at St Leonard’s Church in Penwortham, took services alongside clergy and regularly visited people who were unwell. Rev Nick Mansfield, vicar of St Leonard's, said: "She was faithful and prayerful, she was caring, hard-working and committed - very much part of the fabric of the church. "She was very dedicated and concerned for other people, and even just before Christmas, went to see somebody who was ill."
Mrs King leaves daughter Angela, son Tim, two grandsons and a great-grandson. Mrs King’s funeral will take place at St Leonard’s Church, Marshall’s Brow, Penwortham, at 12.30pm on Monday, January 21. It will be led by Rev Mansfield.